The digital footprints of the Hamilton musical. Home /Editorials, Theatre, Uncategorized/The digital footprints of the Hamilton musical. Jonathan Larson (writer of the legendary Broadway play Rent. ), if he was alive today OR if he was the age he was now when he passed (I.E. : age 36) would he had been a Social Media user? I didn’t think about that at all until I got bit with the Hamilton bug. Yes…I know, I’m pretty late to game on the Hamilton craze. It was the second and third time I gave Hamilton a listen is when the show hit me. The second listen made me obsessed with the catchy songs. The third listen was getting a full grasp of the story of the play and being emotionally involved. It pretty much took me 24 hours to join the legion and become a full on Hamilton fan. In that 24 hours I was able to learn about the shows creator himself. Much like Jonathon Larson, Lin-Manuel Miranda is a young man full of creative energy and enthusiasm (interestingly enough both men are the same age when their respective plays hit.) and the pure love of musicals. 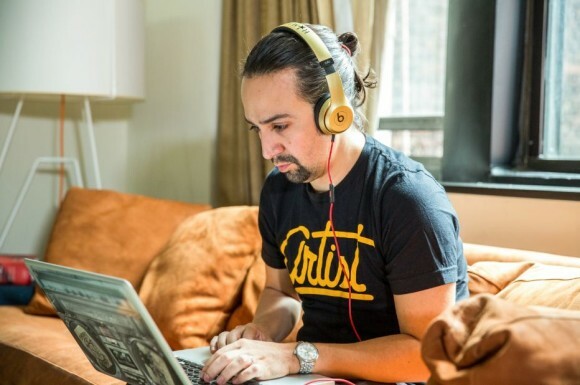 Lin-Manuel Miranda is also CLEARLY a geek, as evident in his Social Media…more specifically his Vine account. And while it was fun seeing him make a geeky fool of himself he also peppered his Vine account with snippets of the show that will change his life. First, I wanna start with the now famous performance he did at White House back in 2009. It’s funny to hear the reaction to this performance as it clearly echos my own first reaction. The audience laughed at places that usually won’t have laughs from the audience now, and yeah, the song is still in the early stages, but it’s fun to see how close Miranda and musical director and orchestrator Alex Lacamoire stayed with this version. But if you were following Miranda on his Vine (his first post was on May 8, 2013) you were actually getting a real time documented look at the making of the now mega popular play. Posted when Miranda was staying at Burr’s house (which is now a Bed and Breakfast place with WiFi no less). He of course was there to get inspiration for the show and do some writing. If you were following Miranda during this time you got an early taste of the one of big moments in the “My Shot” number….. While out of context this early glimpse just seemed like a fun rhyme…. ….only to find out that it’s used in one of the most heartbreaking numbers of the show, “Satisfied”. You would have also gotten the chance to see Miranda and Lacamoire working on the music for the show…. And Miranda shows that it wasn’t easy at all as he post what is clearly his most relatable Vine….. This goes back to my opening thought. Would Larson used social media at all? And if he did, would he share his creative progress and give glimmers of the show? I feel like he would have, as I feel that Larson’s need to be heard as a creator would be fulled by how we can quickly share our creations thanks to the internet. Posting Vines and keeping his audiences updated clearly didn’t hurt Miranda while working on Hamilton, and now we almost have this digital video history on the making of the show that everyone is talking about, which I have to say is really exciting. I wonder where Larson would have posted? Would have done Vines like Miranda? Posted on YouTube with musical Vlogs? And don’t be cynical and mean spirited when I ask these questions, and most of us, (especially creative folks) use some of these sites to keep connected and to keep some sort of creative flow going. And with that…I feel I should leave this post with one more Miranda Vine…and one that feels like the most appropriate since I started this post talking about Larson and Rent….